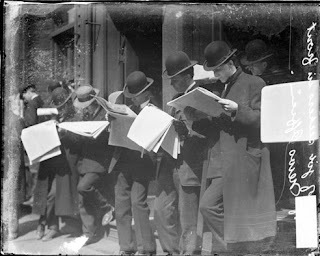 In response to my post "The Most Rapid Alteration of Human Behavior in History," A couple of readers essentially responded, "They're just reading," and sent me links to items like the photo above. First of all, before the photo above was taken, reading had been gradually spreading amongst humans for many thousands of years. Nevertheless, the spread of literacy did represent a profound change in people: we remember far less than our preliterate ancestors did, instead relying on external documents for our memory. No less a figure than Socrates worried about this change, and apparently that is why he never wrote anything. But the photo I used in my post (the one linked to above) was taken, not several thousand, but only a dozen years after the invention of the smartphone. Read the newspaper while biking down a busy NYC street. Drop their newspaper under a bus and die while trying to retrieve it. Go on a dinner date and spend most of their time reading the newspaper. Cause 1.6 million accidents a year by reading the newspaper while driving. Walk into walls, pools, and bears because they were reading the newspaper. Now I don't deny that any of these things might have happened very rarely with newspapers (or books, etc.) in the past. 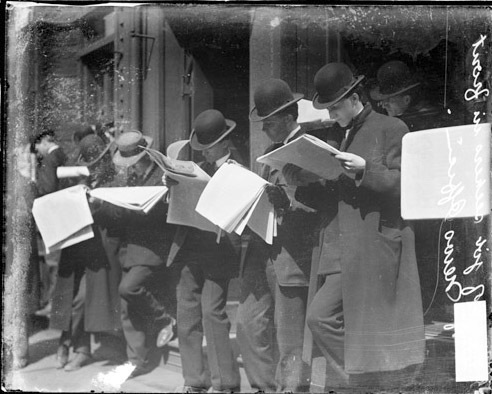 But newspapers did not cause 1 in 4 car accidents, and while every few months I might encounter someone reading the newspaper while walking down the street, today, in NYC, about half the people I see out walking are also on their cell phone. So, when you convince me that newspaper reading was causing similar problems to the above, then I will believe that nothing new is happening. I'm a bit skeptical of the ' 1 in 4 car accidents' claim. I'm pretty sure we haven't see a 20% plus increase in car accidents since the advent of smart-phones. What used to cause the accidents now attributed to smart phones I wonder ?